1737 dancewear is a new premium brand from founder Nikolay Grishko. The Dream Pointe shoe is designed and developed in a world renowned Moscow design center working with dancers from iconic Russian ballet companies including Bolshoi and Mariinsky. 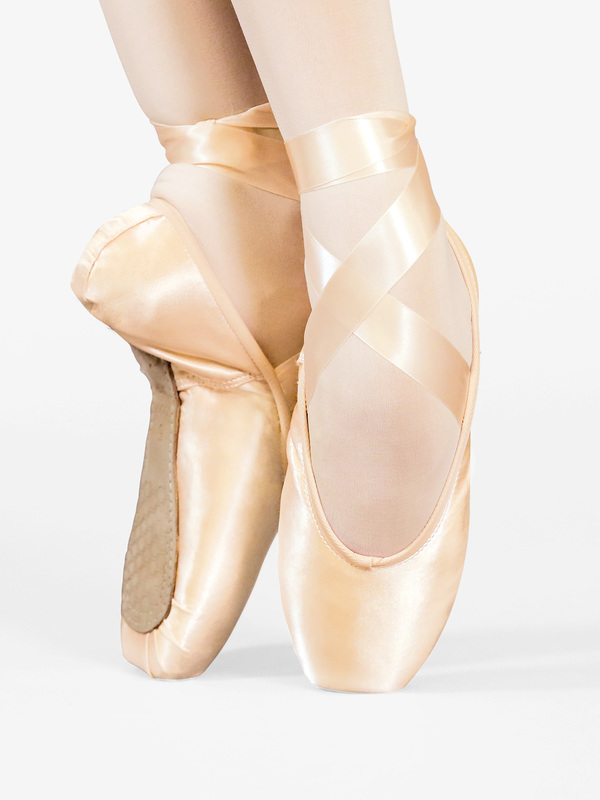 The 1737 Dream is a state of the art pointe shoe that blends artisan shoe making with the latest technologies and materials resulting in a pointe shoe that provides power and efficiency in perfect balance. The unique insole and platform construction combined with the high tech materials provide for an increased lifespan. The wider fore sole gives optimum balance, noise reduction and anti-slip qualities. Soft padding in the platform and the L shaped lining of the velour fabric provide the highest level of comfort. The 1737 Dream has a universal fit and is recommended for advanced students and professionals. Made in Russia. Suggested Fitting: 2 - 2 1/2 sizes smaller than street shoe. DreamPointe is a Grishko 2007-model shoe with a paste box a bit more bulbous than other 2007s (cf. picture) but with a fit that's essentially the same (e.g. I wear 4.5XXX in both). The platform is slightly wider, and it along with the shank are thermoplastic for durability. So, the way the shoe feels when you get it is the way it stays. There's no breaking in! Unlike Gaynors or some Blochs, you cannot blowdry the shank to mold it (it will break! ), so if you need a pre-arched shoe, Grishko's DreamPointe 2007 (aka Allure) or other brands may be more to your liking. There's a small foam pad in the tip and a 2mm felt-like cushiony insole, which reminds me of Russian Pointe's Jewel collection vs. RP Spotlight's plain canvas over card. Some may notice it. Some may not. Having only ever worn full-shank Russians and Grishkos in Hard, I opted for a Medium (MF) to try something flexible that lasts. For barre, this allows an articulation in the foot I generally only get when my Hards are near dying, but here the arch is still supportive. For balances, piques, and snapping releve turns and retires, I think I'd need a harder or fuller shank to not roll over, so for me, one shank strength down equals beyond broken-in shoe that's still supportive for many things, but YMMV. Both the M and the H are 3 quartered, but if you have low-breaking arches, this may not be enough. But if you try this shoe, a fitter tipped me off early to sew my ribbons and elastic at the height of my arch to pull my shanks in as opposed to just keeping the shoe on my foot. This will help enhance the look of your arch! I tried these shoes and really like the idea of the new materials and the design. The shoes are designed to be very modern and uses newer materials and some pre-molded shanks to give the feet the feeling that they are "broken in." It actually works! The shoes do feel like I have worn them before. They also have a soft padding at the toe that gives a little relief from pressure on the toes. Make sure that you order a size comfortable for the width of your toes. They look beautiful on and held up beautifully all through a class and two days of photo shoots. I definitely recommend. I don't know why these aren't listed as such, but these are Grishko shoes. Specifically the 3rd generation of the 2007. And basically these are a hybrid of their 2007, and a Gaynor Minden as they have a synthetic box and shank. I've tried countless shoes but literally nothing fits me besides Grishko 2007's, and well, these. Sort of. The big problem for me is, they're terribly painful to the tips of my big toes. They do have padding there, which I promptly ripped out. It made a slight difference, but not much. I guess burlap, glue, and canvas are softer than rigid plastic (which is what's underneath). And when I ripped up the padding I ended up taking the (super plush) sock liner with is. Underneath is plastic. It's not really hidden or otherwise built into the shoe and I guess it's why the liner is so thick. I don't know, maybe I should just go down a size in width, it's possible these run wider and I was sinking? I was just in so much pain I had to take them off so I don't know. It was difficult to tell what was going on with them while I was trying to pay attention in class. I'll need to experiment more with them. They felt fine when I first put them on... Otherwise the shank is VERY easy to work though. It's strong and supportive, but it feels like it's at that "perfect" stage where it's been worn for a class or so and is now not quite rock hard, but not too squishy either. I tend to wear out my shoes after only a few half hour classes so I was hoping these would work. Other bloggers that have tried them report them as being very stiff, but I think they should just go down a shank strength. I can easily work with the hard shank in the 2007, so the medium in these is perfect. I think if you find the medium shank in the regular paste shoe too much, you should get the soft one in these. The box is plastic as well, so there's no conforming it to your foot. I never squash my boxes so this isn't an issue for me but could be a deal breaker for some. I seriously recommend trying these on in store as they do feel different than the regular 2007's. Not wildly so, but enough that some fans of the 2007 might pass. Are these pointe shoes pre-arched? No, these Pointe shoes are not pre-arched. Nikolay Grishko is the creator of the 1737 brand who was the original founder of Grishko. However, 1737 is a new brand which has no affiliation with the company Grishko USA. This is why you will see similarities in the products. Fitting and suggested sizing will be similar, if not the same. Please follow the sizing instructions on each products page. Is 1737 a branch of Grishko? Nikolay Grishko is the creator of the 1737 brand. Nikolay was the original founder of Grishko, however, it is a new brand which has no affiliation with the company Grishko USA. This would be why you see some similarities in the designs.